Lead Free Quarter Turn Push Connect Straight Ball Valve 1/2" x 1/4" OD. Home :: Push Connect Fittings :: Ball Valves :: 1/4" Turn Lead Free Push Connect™ Straight Ball Valve 1/2" x 1/4" OD. ProBite®'s lead free quarter turn straight push connect™ ball valve connect to copper, CPVC and PEX tubing withoutout the use of glues, clamping or other plumbing tools. With only your hands you can connect our ball valves in a matter of seconds. 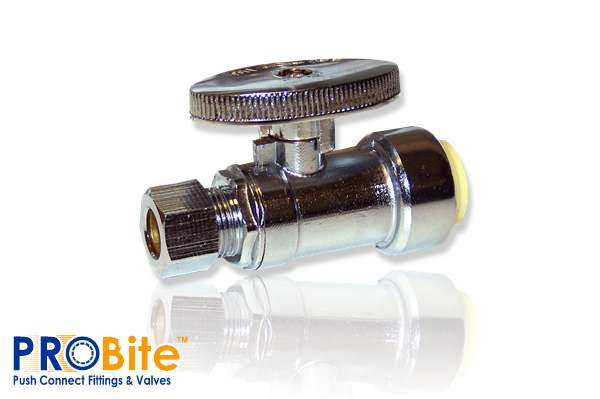 The 1/2" x 3/8" straight stop valve is the perfect solution for a variety of plumbing applications.